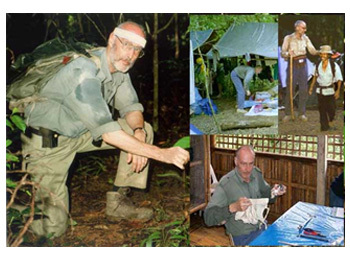 World renowned conservation biologist Prof. Eberhard Curio of Ruhr University, Germany will be arriving in UPLB on March 14, 2015 as Visiting Professor to UPLB, primarily through the Institute of Biological Sciences, College of Arts and Sciences. He has been appointed as Visiting Professor from 14-30 March 2015 and will deliver a series of lectures on conservation during the period. While being hosted by the university, Prof. Curio will be extending his involvement in UPLB with the UPLB Museum of Natural History by acting as a "Visiting Curator" of the Dioscoro S. Rabor Wildlife Collection of the Zoological and Wildlife Museum. 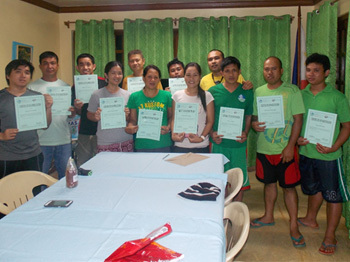 A team from the UPLB Museum of Natural History (MNH) headed by curators Prof. Phillip A. Alviola and Dr. Aimee Lynn B. Dupo trained the staff of the Department of Environment and Natural Resources of Mt. 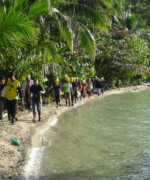 Guiting-Guiting Natural Park (MGNPP) in Sibuyan Island, Romblon on March 2-3, 2015. 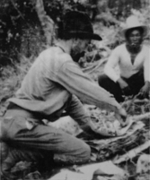 Prof. Alviola and Dr. Dupo with the help of MNH researchers James DV. 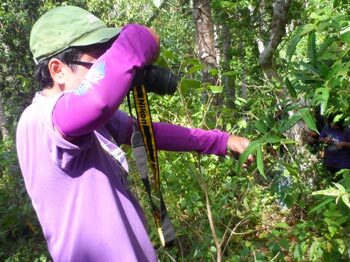 Alvarez and Jeremy Carlo B. Naredo introduced the park staff to the various groups of wildlife and arthropods with highlight on the species found in Sibuyan. The UPLB Museum of Natural History family has reaped another bountiful harvest in this year's university awards for outstanding employees. 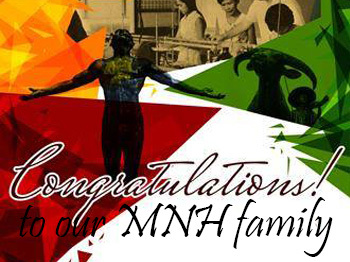 In ceremonies to held today at the Student Union Makiling Ballroom, MNH technician Eduardo G. Eres along with curators Prof. Ivy Amor F. Lambio, Dr. Sheryl A. Yap and DOST Scientist I Mario V. Navasero will be feted as among the university's best during the annual Convocation Program for Outstanding UPLB Personnel. Mulanay town in Bondoc Peninsula is now fully living up to its name as the “Museum Municipality of Trees” thanks to a recent floral inventory by the UPLB Museum of Natural History’s Botanical and Forestry Herbaria on February 2 to 9, 2015. In a partial listing report submitted to the local government unit (LGU) of Mulanay, study lead Michelle Alejado said that during their 5-day inventory, they were able to identify 57 trees, 11 shrubs, 12 herbs and 8 vines within the 284.27-ha Buenavista Protected Landscape (BPL) in Mulanay, Quezon. 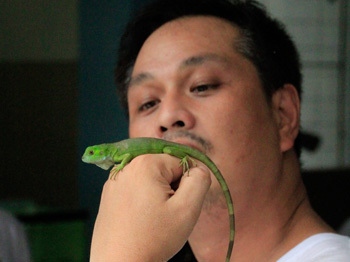 Dr. Juan Carlos T. Gonzalez, Professor at the Institute of Biological Sciences (IBS) and Curator of the UPLB Museum of Natural History’s Zoological and Wildlife Collection, has been appointed as the new director of the MNH effective February 16, 2015. UPLB Chancellor Fernando C. Sanchez, Jr. appointed Gonzalez after receiving the report of the search committee headed by Assistant to the Vice-Chancellor for Research and Extension Dr. Susan May F. Calumpang. Dr. Gonzalez finished his BS and MS degrees in Zoology from UPLB and DPhil in Zoology at Edward Grey Institute for Field Ornithology and St. Anne's College, University of Oxford. He has served as the Deputy Director of the Institute of Biological Sciences and was recently conferred as UP Scientist II. Residents from this once restive town could have never thought that their quiet bird visitors that have arrived and gone for half of the year may have come all the way from a distant land. 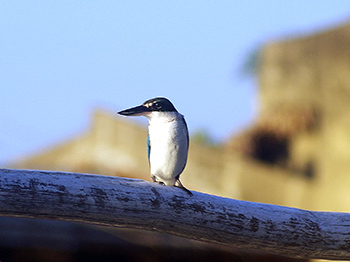 “Some of the birds we see here in our shores were a bit unfamiliar; we hadn’t realized that many of them were actually migratory,” Popot Pereda, a Mulanay native said. Migratory birds have been flying in on the town’s coast in small flocks since November last year, feeding on insects, small crustaceans and fish during low tide. Mulanay, in Quezon Province, lies along the eastern coast of the Philippines and offers a quick rest stop for birds passing through migratory flyways. 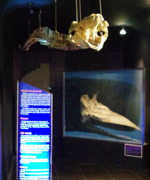 To help Mulanay authorities identify these birds, the Museum of Natural History’s Zoological and Wildlife section recently surveyed more than 20 kilometers of Mulanay’s coastline on February 7, 2015.